Small protest erupts in front of the Foreign Ministry as parents state that the only information they receive is from the media. 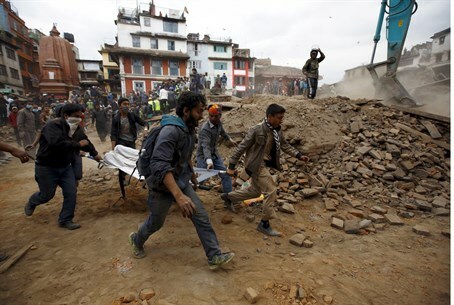 The parents of stranded travelers in Nepal demonstrated in front of the Foreign Ministry in Jerusalem on Monday, calling to step up efforts to rescue their children after a devastating earthquake shook Kathmandu. The protest was held under the banner "Find a Solution with Nepal Government and Military for Rescue Operation," and is in opposition to MFA emergency rescue guidelines which only approve helicopter landings at earthquake sites with explicit IDF and governmental approval. "We're not asking for anything on the State of Israel's budget," one father told Channel 10 Monday night, adding that the current rescue teams lack the necessary resources for a full rescue. "The children are in a life-threatening situation, and have faced adverse weather conditions without warm clothes, food and medicine for over two days," another father added. "We expect a huge effort by any political means available to the State to gain access to the region." Parents have also been relatively uninformed about the situation. "Until now we have to constantly chase after officials and try to find pieces of information, and we do not know anything," one distraught mother said to Army Radio. "The situation there is chaotic - it's total chaos - so we're trying to reach our children as quickly as possible," one father added. Foreign Ministry CEO Nissim Ben Shitrit, invited the parents into the "situation room" to update them on the rescue operation, noting the millions of shekels being invested in the mission and that efforts are being made to hire helicopters to join the operation. A source in the Foreign Ministry said that roughly 100 Israelis are currently still defined as being out of contact, meaning they have yet to be accounted for. The number of people killed in the earthquake has already risen to over 3,726, as bodies continue to be found amid the massive rubble.